As quickly as it arrived it was gone. Last week it rained for one day; that morning the skies were a dark stormy grey and rain poured down for most of the day with an intensity that seemed to finally signal an official start to fall. Being somewhat resistant to change, my heart still longed for summer, for all its light and brightness, but I felt finally ready to welcome the cooler weather and cozier days. I’d changed my mind, call me fickle, but I was now feeling somewhat enamored with fall and all the magnificent sunset shades of the season. Only a few weeks ago, I wasn’t sure that I was ready. Now I thought to myself, this would be the time to start revisiting those classic cold-weather comfort foods, to curl up in a blanket with a warm cup of tea and enjoy the sound of rain tapping on the windows, and therefore the sound of water rushing was a welcoming one. That day socks and a sweater were put on with a shiver and I found myself ambling through the house, my gaze falling on the rain streaked windows each time I passed by. It was grey and gloomy, and I loved it. It surprised me, but I liked sleeping with socks on and waking up to a chilly room the next morning. It was settled, fall was here and I was looking to make something warm and comforting; except that it wasn’t, at least not for long. Just as quickly as the rain had arrived, the sunshine elbowed its way back in and my plans for soup and heartier fare were quickly thwarted. And so, this past weekend the sun shining above, lunch was back outside; a simple salad of carrots with watercress and orange blossom water, bright as summer, yet with the earthy spiciness of cooler weather to come. Bursting at the seams with all sorts of assorted vitamins and minerals, the humble carrot is so tried and true that it has sadly become ordinary. Perhaps the problem is that we have become so accustomed to eating them raw and unadorned as snacks that we seldom think to embellish them. 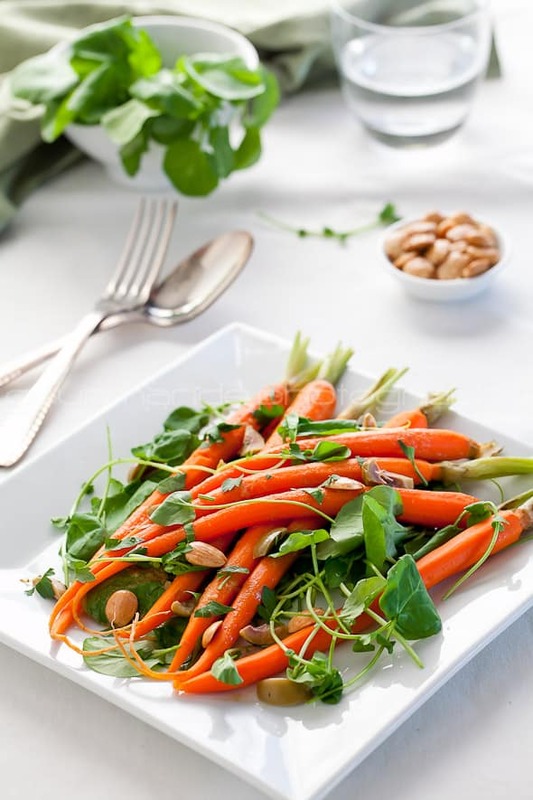 Here a leafy tumble of crisp watercress serves as a bed for cumin scented carrots in a fragrant orange blossom dressing and is punctuated with crunchy marcona almonds and green olives. The cumin adds an earthiness to the carrots, while the orange blossom water lends a bright floral kiss. 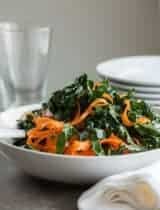 The key to this salad is to allow some time for the flavors of the cooked carrots and dressing to mellow and marry. By the time I sat down to eat, I was almost pleased with fall for having duped me. Bring a large wide shallow pan of water to the boil, adding ½ teaspoon salt. Add whole carrots and simmer about 6 to 8 minutes or until just tender but still firm. Refresh under cold running water. Drain well. In the meantime make the cumin & orange blossom dressing. Combine the cumin, olive oil, white wine vinegar, smashed garlic and orange blossom water in a large bowl and stir to combine. Place the cooked carrots in serving bowl with the dressing (reserving some for later) and toss gently until well combined. Season with salt and pepper. Cover and place in the fridge for 2 hours to develop the flavors. In a large bowl toss the fresh parsley and watercress with the remaining dressing until just combined. Add the carrots and gently combine. Top with chopped green olives and macron almonds and serve immediately. Prepare this recipe up to the point of dressing the carrots 1 day ahead reserving some dressing. Store in an airtight container in the fridge. 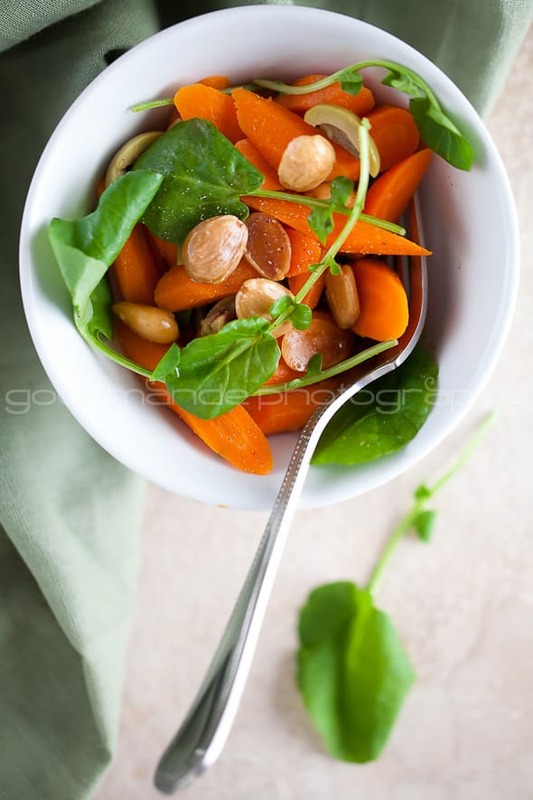 Add the parsley and watercress and reserved dressing to the carrots just before serving and top with olives and almonds. Copyright © 2010-2011 gourmande in the kitchen. What are some of your favorite ways to eat carrots? The intense orange of the carrot is so tempting. Summer or fall, it'd be a pleasure to include this salad in my meal. Stunning images. As usual! I like how you've taken such simple ingredients have transformed it into this gorgeous salad. So colorful and bright! Perfect for summer. Pretty salad. I love the sound of orange blossom in it. 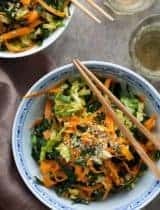 What a beautifully written post, and stunning photos of carrots and this unique salad to go along. You're right, carrots don't get the attention they deserve - this salad certainly puts them center stage. we had a false start too...snow and freezing rain on Saturday and today the high is in the 70s with big sunny skies! regardless i'm just happy to have the versatility in the weather and a go-to salad like this one to have when it's beautiful out! I agree..I long for fall, but when it's here I want summer back! This sounds really good, and that pic of the carrots is gorgeous! I can't wait to make this! So fabulous as always! I'd be happy with even a false start in our desert here in Dubai. Haven't seen a drop of rain since last year! Very refreshing sounding dressing with blossom water....wonder how it would taste with roasted carrots?! Just beautiful. I love marcona almonds -- they're really something special. Lovely dish. Cumin Garlic and orange blossom are calling my name here.. perfect blend of flavor and perfect colors of the fall. 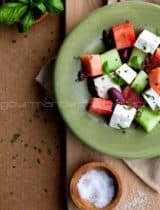 I am with you - i am a summer person and can't let go - i dont like the cold or the dark nights, but then i can't find a place to live where these are four seasons warm summers no snow during winter and close to mountains and water. . .gorgeous salad. I am certainly ready for fall and this dish sounds like the perfect way to ring in the season. What a lovely, fresh salad. We had some amazingly warm weather here too this past weekend. So much so, we actually went to the beach. In October! Could have used your lovely fresh salad for dinner. Gorgeous! So fresh and vibrant. I have only tried orange blossom once and discovered to my dismay that I wasn't a big fan, but there are plenty of things to substitue that with. 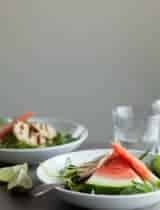 Try making it a spicy salad and replace the orange blossom water with some harissa! Your photos are stunning, as usual. We too had an unusual bout of cool weather, making me SO ready for fall. Unfortunately it is supposed to creep back up near 100 in the next few days. Oh well :) This salad sounds delicious. Simply gorgeous. I love the combination of colours, textures and flavours in this salad. Cumin and orange blossom water, divine. I love learning about new ingredients and can't wait to try the orange blossom water in other recipes. The salad was both beautiful and delicious! Stunning salad Sylvie! my mouth is watering! Carrots, cumin, and marcona almonds...just a few of my favorite things to eat. This is simply gorgeous, Sylvie. I've never had this combination of carrots with orange blossom water - but will rectify. Sounds delicious, looks lovely, gorgeous pics. Stunning photos, as always, Sylvie and the words that go along with it made me feel like I was with you, looking out at the rain, welcoming Fall! Stunning photos, as always Sylvie. I love the vibrancy of the carrots and that you've paired them with cumin too, as that is a favourite combination of mine. I wish I could gobble up the bowl from the screen, the carrots look particularly inviting..this dish is perfect all year long. Love the 1st photo Sylvie, absolutely stunning! The recipe looks so freshm love the combination of the ingredients! Absolutely gorgeous, Sylvie!!! Your photos always make my mouth water. I have a lot of orange blossom water lying around in my fridge. I know just the thing I'm doing with it. 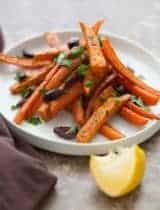 i've been making quite a few recipes with carrots lately Sylvie - as you said, most people think of carrots as an afterthought but good carrots, really good carrots are wonderful! Aw, too bad. We all have things we aren't fond of. I'll still trying to warm up to beets! I actually love the combo of watercress and carrots together. the crispy sweet taste of the carrot against the peppery taste of the watercress- yummy! The pictures are just PHENOMENAL. Beautiful and vibrant, Sylvie. I love keeping floral waters on hand for perfuming fruit salads, rice pudding or other creations. Just love your salad! I was ready for fall a month ago - but temps have popped back into the 80s with lots of humidity (though I think todays rain will break that). These carrots are beautiful and the entire salad sounds amazing. This is one for the “to try” que! It looks so so good! Gorgeous! I love how you turned humble, raw carrots into something truly divine. Sounds amazing. I would never have thought of using orange blossom water in a salad - I always use it in desserts. A very creative way to use it - I'll have to try it out! Absolutely beautiful, Sylvie! And although anticipating the cooler weather is wonderful, so is the shot of unexpected warmth. This is a salad my wife would love. I've been craving something to warm me up and this looks ideal. I'm excited to see how the cumin tastes in the salad (I love cumin!). Thanks for sharing! How fresh and healthful this looks! I also hate to see summer go even though it was a little overbearing this year. Sounds heavenly Sylvie. I too am ready for fall, however the sunshine and 80° weather that popped up recently has been delightful. This salad sounds perfect and refreshing. I'm wondering how it would be with arugula (from my CSA box this week) instead of watercress. 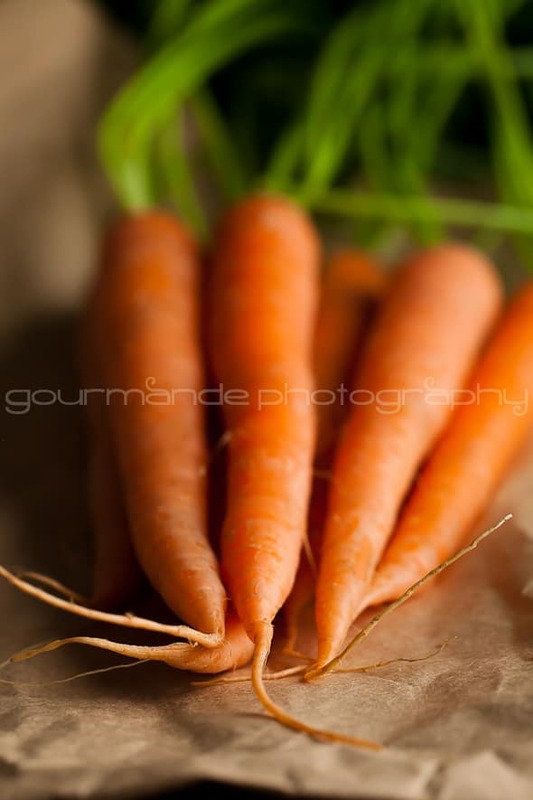 PS - I just love the photo of the bunch of carrots. Thanks Jen! I think arugula would be great here too. 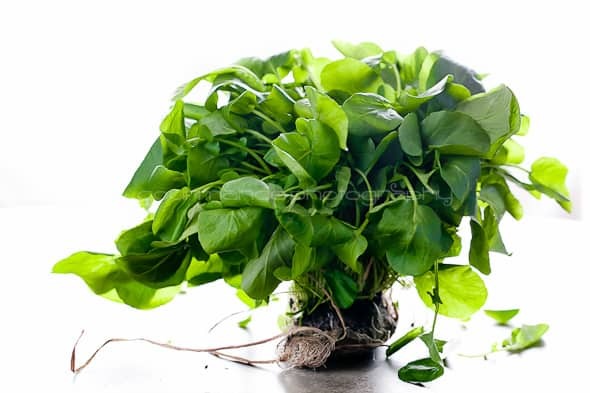 I'm mesmerized by that picture of the watercress. And where did you buy the orange blossom water? I want some, I love it! I buy it at the Persian market near me, but I'm sure you could find it elsewhere. Sensational vivid colors! Like you it takes time for me to adjust to Fall - I love spring and summer. Fall always reminds me of what lies behind it - Winter! This salad is a great way to welcome Fall! I love fall too, Sylvie...one wonders why I live in Florida! We won't get our fall for a month or so, although we had a slight taste of it last week. Just the lack of humidity helps. 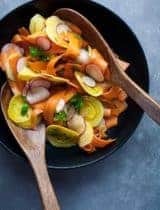 Your carrot salad is bright, healthy and the flavors sound wonderful! Sylvie you can give me the fall and this salad any time! The orange blossom water is the perfect touch to highlight these fresh ingredients. Stunning! Sylvie, This is a stunning dish on two levels - both from the viewpoint of flavor profiles and photography. Congratulations on the Top 9...Brava! What a pretty looking salad and what a lovely combination of ingredients. Great photography too. I have a wonderful orange vinaigrette so now I must try your orange flower water one. 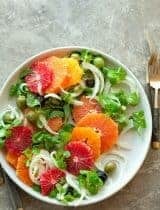 Gorgeous salad that would bring sunshine even to a cold, rainy day... and stunning photos as always. I love not being the only one who goes to bed with socks !! (thing I admit is far from sensual) very Moroccan flavors, which I adore! I really dream of summer! What a lovely idea - I sometimes use orange blossom water in my pancakes - so floral and fragrant! I really like your style of photography. Healthy and refreshing salad is so nice. Congratulations on top 9! Oh Sylvie, this is stunning. I'm always so torn when summer saunters away. But the crisp weather is a great comfort. Hello Sylvie, The carrot salad plus watercress is looking awesome, so fresh and healthy, wow... ! 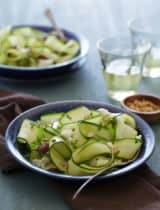 Loved the pictures.I've bookmarked this special recipe of urs and wud love to give it a shot asap. Have a wonderful week ahead. Thanks & Regards, Sonia !!! Gorgeous salad. Fall or summer I would have this anytime. Of course I always love your photos and now I'm in even more awe of your skills. I find orange one of the hardest colors to photograph. It always seems to take on this glowing, radioactive like effect when I shoot. this sounds magical and the colours are beautiful. I am certain it tasted great as well. your photos are stunning. When I was little I lived off carrots and cheese sandwiches. It caused my parents endless worry but it was my love affair with carrots and not theirs. The point is your photo is stunning and would look gorgeous in my kitchen, making my heart swoon daily. This is almost to precious looking to even consider eating it...it's your lovely styling and photography skills that transport it to art, not just food. Spectacular, as always. The light on the carrots in pic #1 is just perfect. Where can I find blossom water ?